Salvador Dalí was an essential figure in Surrealism. His extravagant nature and the fanciful imagery that surrounded both his art and his life made him one of the best known and most controversial twentieth-century artists. Dalí began training as an artist with the Impressionist painter Ramón Pichot in Figueras, and in 1922 he enrolled at the Academia de Bellas Artes de San Fernando in Madrid, where he studied until his expulsion in 1926. 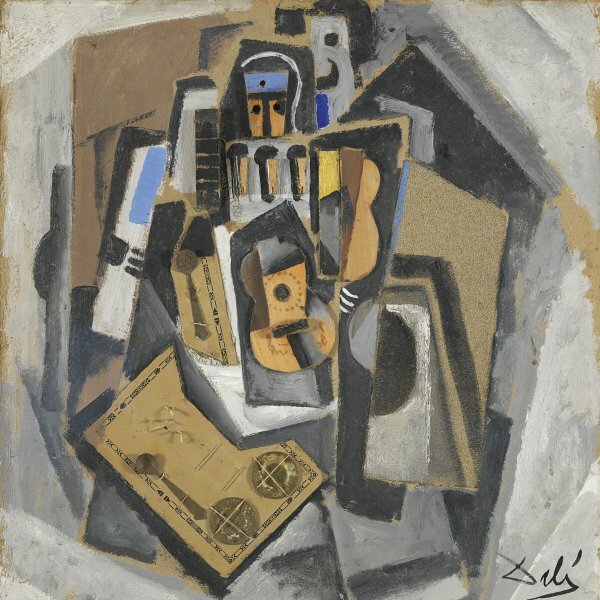 In 1925 the Galería Dalmau in Barcelona staged his first one-man show, which attested to the young Dalí’s repertoire of different styles: Cubist-inspired paintings were displayed alongside others in which Ingres appeared to be the predominant influence and a group of still lifes that recalled Carlo Carrà and Giorgio de Chirico. During his formative years in the Spanish capital, Dalí lived at the Residencia de Estudiantes, where he became a friend of Luis Buñuel and Federico García Lorca. He collaborated with his friends in many fields of art, such as designing the scenery for Mariana Pineda, Lorca’s first play to be staged in 1927, and in Buñuel’s film Un Chien andalou in 1929. In 1929 Joan Miró introduced Dalí to the Paris Surrealists, who expelled him from the group in 1934 for his political ideas. In 1930 he developed his “paranoiac-critical” method, which would become his chief contribution to the Surrealist movement. According to this method, invented by Dalí on the basis of Freud’s theories on the interpretation of dreams, every image or association of images could be read with a double meaning. Dalí went on to create a whole universe of symbols and obsessions inspired by psychoanalysis, rendered carefully in a realistic style. Special mention should be given to Dalí’s relationship with his wife and muse, Gala, who played an essential role throughout his artistic career. In 1940 he and Gala emigrated to the United States, where they lived until 1948. In America Dalí partly abandoned painting and devoted himself fully to decorating shop windows, creating film sets for Holywood, and designing the covers of magazines like Vogue. On returning to Spain he settled in Port-Lligat with Gala, and opened the Teatro-Museo Dalí in Figueras, his hometown, in 1974.